Pad Thai, or Phad Thai, is a stir-fried rice noodle dish commonly served as a street food at casual local eateries in Thailand. It is thought by some to have been introduced to Ayutthaya during the time of the Ayutthaya Kingdom by Chinese traders and subsequently altered to reflect Thai flavor profiles. Join Chef Sunisa in this exploration of one of Thailand’s most versatile national dishes. Our menu will include Spicy Shrimp Soup (Tom Yum Kung), Pad Thai and a refreshing Mango Sorbet. 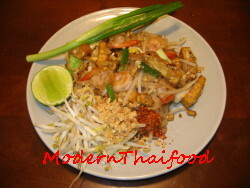 Pad Thai is listed at number 5 on list of World’s 50 most delicious foods readers’ poll compiled by CNN. Come see why!